Neurotoxins may be synthetic or endogenous compounds derived from species as diverse as bacteria, fungi, spiders, marine life, and man. Seven botulinum neurotoxin (BoNT) serotypes (A, B, C, D, E, F, and G), which are produced by Clostridium botulinum and other Clostridium species, inhibit neurotransmitter release from nerve terminals. These serotypes of BoNT are antigenically dissimilar, utilize distinct but related mechanisms of action, and are not interchangeable. Only BoNT serotypes A and B are approved by the Food and Drug Administration for treatment of neurological disorders and for cosmetic indications. Neuroexocytosis, a multistage process leading to the fusion of synaptic vesicles with the plasma membrane, involves proteins collectively called SNAREs (soluble N-ethylmaleimide–sensitive factor [NSF] attachment protein receptors). Following calcium entry into the nerve terminal, 3 SNAREs form a highly stable SNARE complex which is required for fusion of synaptic vesicles with the inner surface of the plasmalemma. Membrane fusion allows the subsequent release of acetylcholine (ACh) from synaptic vesicles into the neuromuscular synaptic cleft, resulting in an action potential in the muscle that causes it to contract. After BoNT binds to its receptor and is internalized into the nerve terminal, the BoNT proteolytically cleaves its SNARE substrate, thereby blocking neuroexocytosis. Although it is generally assumed that the effects of BoNTs are restricted to the peripheral nervous system, studies suggest that BoNTs, especially at high doses, may affect higher structures in the brain. BoNT may also alter the excitability of central neural circuits, both at spinal and cortical levels, by modulating peripheral sensory inputs. The engineering of BoNTs is a crucial step in the evolution of neurotoxins, both as research tools and for clinical therapy. Modifying the pharmacological properties of neurotoxins through protein engineering may expand and improve the efficacy of future neurotoxin-based therapies. Through the use of recombinant technology, combining advantageous therapeutic features of each serotype has led to the development of a chimeric recombinant toxin that effectively blocks the release of pain peptides. For example, targeting a chimera of BoNT-E and BoNT-A to nociceptive neurons is a potential new therapy for pain. The effects of BoNT occur 2 to 5 days after injection and can last 3 months or longer, but they wear off gradually as a result of pharmacokinetic and intracellular events. To achieve the best possible outcome, treatment with BoNT should be tailored to the individual needs of the patient. In the past, repeated treatments occasionally led to a progressive decline in therapeutic response caused by the development of neutralizing antibodies against BoNT. However, the current formulation of BoNT type A (BoNT-A) has a much lower protein load and is, therefore, associated with a greatly reduced incidence of antibody production. Understanding the mechanism of action of BoNT-A has led to the worldwide treatment of more than 100 human conditions due to hyper-activity of nerves supplying various muscles or glands. Neurologists, physiatrists, endocrinologists, ophthalmologists, otolaryngologists, urologists, dermatologists, dentists, occupational therapists, rheumatologists, and other healthcare professionals involved in the treatment of various musculoskeletal, secretory, and pain disorders using neurotoxin therapy. This activity has been planned and implemented in accordance with the Essential Areas and policies of the Accreditation Council for Continuing Medical Education (ACCME) through the joint sponsorship of Beth Israel Medical Center and Scientiae, LLC. The provider is accredited by the ACCME to provide continuing medical education for physicians. Beth Israel Medical Center & St. Luke’s and Roosevelt Hospitals designate this educational activity for a maximum of 1.0 AMA PRA Category 1 Credit(s)™. Physicians should only claim credit commensurate with the extent of their participation in the activity. July 2010 through July 2011. Original Release Date: July 2010. It is the policy of Beth Israel Medical Center & St. Luke’s and Roosevelt Hospitals that faculty and providers disclose real or apparent conflicts of interest relating to the topics of this educational activity, and also disclose discussions of unlabeled/unapproved uses of drugs or devices during their presentation(s). Beth Israel Medical Center & St. Luke’s and Roosevelt Hospitals have established policies that will identify and resolve all conflicts of interest prior to this educational activity. This CME activity discusses the off-label use of botulinum neurotoxin. Dr. Bressman has indicated no conflict of interest. Consultant and/or Advisory Committee Member: Allergan, Inc. This activity is jointly sponsored by Beth Israel Medical Center & Scientiae, LLC. It is supported by an unrestricted educational grant from Allergan, Inc.
Lower urinary tract symptoms (LUTS) from genitourinary conditions such as overactive bladder, detrusor-sphincter dyssynergia, interstitial cystitis, benign prostatic hyperplasia, and prostatitis are relatively common. Currently available medical and surgical management for these conditions leaves room for improvement. Beyond applications in plastic surgery, dermatology, and neurology, botulinum neurotoxin (BoNT) injection has been studied for the management of LUTS caused by these genitourinary conditions. BoNT affects hypercontractability, hypersensitivity, and glandular hypertrophy. Dose and duration vary according to the disease being treated as well as the particular BoNT product. In general, over the past 6 years, numerous urological studies have shown promising results with symptom relief of up to 6 months or longer as well as improvement in quality of life. BoNT is generally well tolerated, with some impact on post-void residual urine and urinary tract infection. The optimal dose dilution, number, and location of injection are still under investigation. Botulinum neurotoxin shows promise for treating a variety of genitourinary conditions affecting the lower urinary tract. The lower urinary tract (LUT) encompasses the urinary bladder and the urethra and has two main functions: storage and voluntary voiding of urine. As described for the individual conditions below, LUTS can result from dysfunctions at various locations of the lower urinary tract functional unit as well as at the level of the prostate.2 During bladder filling, the internal sphincter remains contracted because of tonic background adrenergic tone. The detrusor muscle produces coordinated bladder contractions, leading to bladder voiding. This muscle is innervated by the pudendal nerve; cholinergic fibers predominate in the body of the bladder, but adrenergic fibers are present in the body and the neck of the bladder. The LUT is innervated by three groups of peripheral nerves: sacral parasympathetic, lumbar sympathetic, and sacral somatic nerves. Urine is stored when the external urethral sphincter muscle (somatic) and the internal urethral sphincter muscle (sympathetic) are contracted and the detrusor muscle and sacral parasympathetic activity are inhibited through sympathetic mediation. 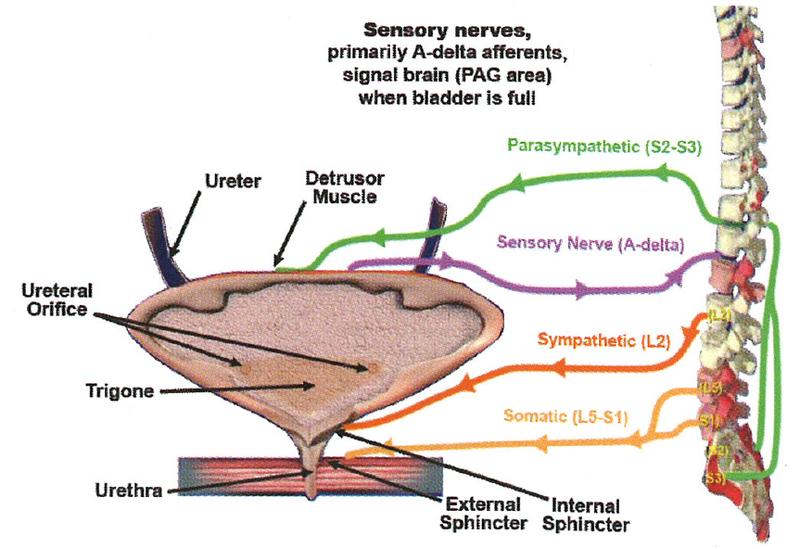 During the act of micturition, descending pathways originating from the pontine micturition center inhibit the external urethral sphincter and sympathetic outflow (inhibition of the vesicosympathetic reflex), activate parasympathetic outflow to the bladder, and activate parasympathetic outflow to the urethra. Neural pathways controlling LUT function are organized as simple on-off switching circuits that control urinary bladder filling and emptying. Alpha and C afferent pathways initiate micturition.4 Alpha fibers exhibit graded response to passive distention, whereas C fibers, activated by inflammation and noxious stimuli, have a much higher threshold. Bladder fullness is detected by receptors in the bladder wall that activate the sacral parasympathetic nerves; the impulses reach the cerebral cortex through the spinothalamic tract. Detrusor-sphincter dyssynergia (DSD) is a spastic condition commonly seen in patients with neurologic insults, including spinal cord injury (SCI) and multiple sclerosis (MS). DSD affects the nerves that control the skeletal and smooth muscles of the urinary system, causing a lack of coordination between the bladder and the external sphincter. As reviewed by Schurch and colleagues, the current treatments for DSD leave room for improvement. Anticholinergics are used to block the efferent parasympathetic innervations in DSD, but these medications are associated with troublesome side effects and may be insufficient to restore continence. Sacral root rhizotomy has a role but should be restricted to patients with complete suprasacral cord lesions; this cannot be used in men who want to preserve reflex erections. Phenol injections into the subtrigonal region of the bladder usually provide only a transient benefit. Capsaicin is effective in patients with MS or spinal cord injury (SCI); however, the data are mixed, and some patients are nonresponders. The diterpene analog resiniferatoxin is more potent than capsaicin and may have some benefit. Stimulation of the pudental nerve may provide some short-term benefit, but long-term benefits are rare.11 Sphincterectomy is a surgical option,10 but most urologists agree that medical management options should be exhausted before resorting to this procedure. In a study including 29 DSD patients who received urethral injection of onabotulinumtoxinA, 28% subjectively reported an excellent result and 52% reported significant improvement.18 Smith et al reviewed the 6-year experience of 110 patients with voiding dysfunction resulting from a variety of LUT disorders, including DSD, who received onabotulinumtoxinA injections into the bladder or urethra.19 Maximal efficacy of onabotulinumtoxinA occurred between 7 and 30 days post-injection, with neither systemic nor local complications observed. Over 67% of the 110 patients reported a decrease or absence of incontinence, with a decrease in both daytime and nighttime voiding symptoms, as well as improved QoL symptom scores.19 Other BoNT-A products as well as the BoNT-B product rimabotulinumtoxinB are also used clinically to manage DSD,20 but the evidence base on these agents is less established. Although the results of studies of BoNT in DSD are encouraging, they are difficult to interpret because of the small numbers of patients, wide range of doses, and variable outcome measures employed in these studies. The 2004 International Consultation on Incontinence (ICI) considered there to be fair, research-based evidence (individual cohort studies, including randomized, controlled studies) to support the recommendation of BoNT for DSD. ICI recommendations for practice stated that BoNT sphincteric injections may be an alternative to sphincterotomy for DSD (personal communication, Michael B. Chancellor, MD). Controlled studies with well-defined patient populations and validated and reproducible outcome measures are needed. Overactive bladder (OAB) syndrome is characterized by urinary frequency and urgency, with or without urgency incontinence.3,21 The underlying cause of OAB syndrome is detrusor overactivity (urodynamically demonstrable involuntary bladder contractions), which is subdivided into neurogenic detrusor overactivity (NDO) or idiopathic (non-neurogenic) detrusor overactivity (IDO).3OAB syndrome can have a significant impact on the patient’s QoL, affecting interpersonal and sexual relationships and causing the patient to feel embarrassment and loss of self-confidence. Antimuscarinics are the first choice of agents in the pharmacotherapy of OAB and are supported by level I evidence (ie, evidence obtained from at least one properly designed randomized clinical trial). These agents have demonstrated acceptable efficacy, safety, and improvements in QOL.21 However, because muscarinic receptors are also found in the salivary glands, gastrointestinal smooth muscle, eyes, heart, and brain, antimuscarinics can have side effects such as dry mouth, constipation, blurred vision, tachycardia, and cognitive problems.21,29 For the patient who is antimuscarinic refractory, sacral neuromodulation and surgical augmentation cystoplasty can be considered. Herschorn and colleagues36 presented a randomized, double-blind trial of onabotulinumtoxinA injection for treatment of NDO and urinary incontinence at the International Continence Society (ICS) 2009 meeting. In this study, 57 subjects with NDO because of either SCI or MS received a single intravesical injection of 300 U onabotulinumtoxinA or placebo and were followed up to 36 weeks. The investigators found that urinary incontinence episodes decreased at Week 6 (-57.1% change from baseline, P<.001), with persistence up to Week 36 in the onabotulinumtoxinA arm. Similar adverse events were seen in both arms, and patients reported an improvement in QoL. The 2004 International Consultation on Incontinence (ICI) considered there to be fair, research-based evidence (individual cohort studies, including randomized, controlled studies) to support the recommendation of BoNT for OAB. ICI recommendations for practice stated that BoNT injections may provide an alternative therapy for detrusor overactivity if conventional therapy fails (personal communication, Michael B. Chancellor, MD). In terms of dose optimization with BoNT-A, in previous studies using onabotulinumtoxinA for OAB or IDO, most investigators used detrusor injections of 200 U or 300 U of onabotulinumtoxinA.42 Kessler et al treated 11 patients with IDO with detrusor injections of 300 U of onabotulinumtoxinA,42 and the maximal bladder capacity increased from 220 mL to 340 mL. However, 9 patients needed clean intermittent catheterization (CIC) due to large PVR volume. Rajkumar et al treated 15 women with IDO with detrusor injections of 300 U of onabotulinumtoxinA, and 14 had improvements in urgency and frequency. The therapeutic effects lasted for 5 to 6 months.43 Popat et al used 200 U of onabotulinumtoxinA for 31 IDO patients. Although significant improvement in bladder capacity was noted after treatment, 19% of the patients needed CIC post-treatment.44 Schulte-Baukloh et al used 300 U of onabotulinumtoxinA detrusor and urethral injections for 7 women with OAB without detrusor overactivity. The bladder capacity increased by 20%, and all patients could void without the need for CIC.45 In a study by Kuo, detrusor injections of 200 U of onabotulinumtoxinA provided a 73.3% success rate in 30 IDO patients, with a mean therapeutic duration of 5.3 months.46 A recent meta-analysis conducted by Anger and colleagues47 summarized 23 full articles of intravesical onabotulinumtoxinA injections in idiopathic OAB, including three randomized, placebo-controlled trials, accounting for 99 patients. Treated patients had 3.88 fewer incontinence episodes per day. While QoL was also improved, onabotulinumtoxinA-treated patients had a 9-fold higher increased risk of elevated PVR volume compared with placebo-treated patients. Dmochowski et al evaluated onabotulinumtoxinA over a range of doses, from 50 U to 300 U, in a phase 2, multicenter, randomized, double-blind study of 313 patients with idiopathic overactive bladder and urinary urgency incontinence.48 In this study, doses above 150 U of onabotulinumtoxinA did not appear to add much incremental benefit, particularly when balanced with PVR urine-related safety parameters. Data from this trial suggests that a dose of 100 U may be the dose that appropriately balances the symptom benefits with the post-void residual urine volume related safety profile. Intravesical onabotulinumtoxinA injection plus hydrodistention may have dual effects: 1) inhibiting release of sensory nerve neurotransmitters, and 2) inhibiting acetylcholine release in the neuromuscular junctions of the detrusor. Hydrodistention alone may have an effect on increased bladder capacity and may excite the sensory nerves in suburothelium; together, these effects might potentiate the effect of onabotulinumtoxinA on sensory receptors in the bladder wall. Several technical points should be made about injecting BoNT in the LUT. 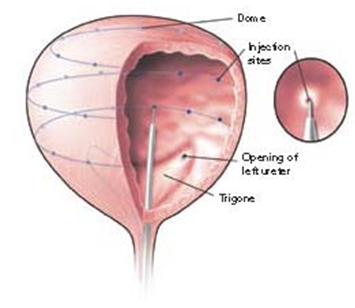 Urethral sphincter injection with onabotulinumtoxinA is performed by mixing 100 U to 200 U of onabotulinumtoxinA with approximately 4 mL of sterile saline just before injection. In the male patient, a rigid cystoscope and a standard cystoscopic injection needle are used to inject equal aliquots of onabotulinumtoxinA into the external sphincter at the 3-o’clock, 6-o’clock, 9-o’clock, and 12-o’clock positions. The preferred method in female patients is to use a fine-gauge spinal needle to inject onabotulinumtoxinA periurethrally at the 3-o’clock, 9-o’clock, and 12-o’clock positions approximately 1 cm from the urethral meatus. The needle is inserted parallel to the urethra to a depth of approximately 2 cm. OnabotulinumtoxinA can be injected into the detrusor, suburothelium, or trigone to treat patients with OAB, IDO, or IC/PBS. One hundred units of onabotulinumtoxinA is usually reconstituted to 10 mL with normal saline. Detrusor injection can be performed by injecting onabotulinumtoxinA solution at 10 to 20 sites (Figure 3). The injection sites will be equally distributed with 0.5 to 1.0 mL for each injection. Suburothelial injection can be performed using a procedure identical to detrusor injections, except that the needle is inserted just into the suburothelial space and a ballooning formation is noted during infusion of onabotulinumtoxinA solution. The bladder volume is typically kept at 150 to 200 mL during the injection procedure. Patients usually report symptom improvement after a few days and continue to improve during the first month. 85 After this period, the patient will also feel a gradual increase of difficult urination and incomplete emptying. In a randomized, controlled trial of onabotulinumtoxinA in women with OAB, Brubaker et al also found a 43% incidence of large PVR volume needing clean intermittent catheterization (CIC).89 Although large PVR volumes, UTIs, and chronic urinary retention remain obstacles for the wide application of onabotulinumtoxinA in the treatment of refractory detrusor overactivity (DO), there has been no factor to predict the occurrence of AEs after onabotulinumtoxinA injection. In a recent study, large PVR volumes requiring CIC occurred in 29% of patients treated with 200 U of onabotulinumtoxinA.90 Risk factors for incomplete emptying included lower maximum flow rate (Qmax), lower projected isovolumetric pressure, and lower bladder contractility index.90 Although, in another study, injecting 200 U of onabotulinumtoxinA has been found to be safe in elderly patients, the detrimental effect of retention on QoL can be considerable.91 However, a recent study by Kessler and colleagues conducted in women with IDO undergoing BoNT injections showed that change from baseline in Urogenital Distress Inventory and Incontinence Impact Questionnaire before and 4 weeks after BoNT were improved in women requiring CIC. In addition, these women did not experience an impaired QoL in the short term after onabotulinumtoxinA therapy.92 The authors suggest that all patients should be informed about the potential for CIC after onabotulinumtoxinA injections. Prostatitis is the most common diagnosis for men under 50 years of age presenting in outpatient urology clinics, with a prevalence rate estimated between 2% and 9.7%.96,99,100One of the risk factors for prostatitis is a history of sexually transmitted disease. BPH arises through a hyperplastic process that involves the fibromuscular stromal and glandular epithelial elements of the prostate, with a role for inflammation as well.98 The resulting increased size of the prostate compresses the prostatic urethra, leading to bladder outlet obstruction and LUTS. Available evidence suggests that intraprostatic BoNT injection improves lower urinary tract symptoms (LUTS) and flow rate but with minimal to modest decreases in prostate volume. The duration of effect appears to be 6 to 12 months.105 Urethral, perisphincteric, or intraprostatic BoNT-A injection might have therapeutic benefits in human nonbacterial prostatitis or chronic prostatic pain.105 Patients with BPH, chronic prostatitis, or chronic pelvic pain syndrome (CPPS) refractory to conventional treatments may have an alternative consideration with BoNT.105,109 In addition, older frail patients may benefit from this less invasive procedure. Silva and colleagues110 examined responses at both 6 months and 18 months after a single, intraprostatic injection of 200 U onabotulinumtoxinA in 21 men with refractory urinary retention secondary to BPH who were unfit for surgery. Mean prostatic volume decreased from 82 ± 16 mL at baseline to 49 ± 9.5 mL at month 6 but returned to baseline values at 18 months. The patients resumed spontaneous voiding at month 1. Qmax, PVR volumes, and International Prostate Symptom Score (IPSS) were maintained over the 18-month period. Injections of BoNT into the prostate can be carried out transperineally, transrectally, or transurethrally. Of these three possible approaches, transperineal injection provides the lowest risk of UTI. However, transrectal prostatic injection is the procedure that urologists are most familiar with and most commonly use for prostate BoNT injection. Prostate injections are performed by mixing 100 to 200 U of onabotulinumtoxinA with saline just prior to injection. For those with a prostate volume larger than 60 mL, more than 200 U may be necessary. The preparation and positioning of the patient are identical to those used for transrectal or transperineal ultrasound-guided prostate biopsy. Some urologists may prefer transurethral prostate injection using a familiar cystoscope and injecting needle to approach the enlarged prostate gland. During treatment, 200 U of onabotulinumtoxinA is reconstituted with 4 mL of normal saline. Chuang et al112 used a 23-gauge-long needle under TRUS guidance with the transverse and sagittal views to ensure proper placement of the needle as a bright spot in the center of each lateral lobe where 2 mL of BoNT are injected into each side (Figure 4). Under TRUS guidance, the injecting solution is adequately distributed within the volume of the prostate gland. Diffusion of hyperechoic BoNT over the lateral lobe of the prostate can be easily seen with TRUS monitoring. BoNT solution should be equally distributed to bilateral lobes, including the median lobe. After BoNT injection into the prostate, a certain percentage of patients might develop AEs, such as gross hematuria, difficult urination, perineal pain, or acute prostatitis. These AEs are caused by inadvertent penetration of the injection needle through the prostatic urethra in patients with asymmetry of the prostatic lobes, volume effect of the injected toxin, or inadequate sterility of the procedure. Selection of a small-gauge needle, careful insertion of the needle under sonographic guidance, small injecting volume, and adequate sterility usually can reduce these AEs to a minimum. 1. Chancellor MB. Ten years single surgeon experience with botulinum toxin in the urinary tract; clinical observations and research discovery. Int Urol Nephrol 2010;42(2): 383-91. 2. Llorente C. New concepts in epidemiology of lower urinary tract symptoms in men. Eur Urol Suppl 2010;9: 477-81. 3. Abrams P, Cardozo L, Fall M, et al. The standardisation of terminology of lower urinary tract function: report from the Standardisation Sub-committee of the International Continence Society. Am J Obstet Gynecol 2002;187(1): 116-26. 4. Chancellor M, Yoshimura N. Physiology and pharmacology of the bladder and urethra. In: Walsh P, Retik A, Vaughan E, Wein A, editors. Campbell’s Urology. Philadelphia, PA: WB Saunders, 2002:831-86. 5. Erol B, Kocak T, Kadioglu A, et al. [The relationship between level of injury and bladder behavior in patients with post-traumatic spinal cord injury]. Ulus Travma Acil Cerrahi Derg 2009;15(4): 377-82. 6. Meng NH, Lo SF, Chou LW, Yang PY, Chang CH, Chou EC. Incomplete bladder emptying in patients with stroke: is detrusor external sphincter dyssynergia a potential cause? Arch Phys Med Rehabil 2010;91(7): 1105-9. 7. Onal B, Siva A, Buldu I, Demirkesen O, Cetinel B. Voiding dysfunction due to multiple sclerosis: a large scale retrospective analysis. Int Braz J Urol 2009;35(3): 326-33. 8. Jost WH, Naumann M. Botulinum toxin in neuro-urological disorders. Mov Disord 2004;19 Suppl 8: S142-5. 9. De EJ, Patel CY, Tharian B, Westney OL, Graves DE, Hairston JC. Diagnostic discordance of electromyography (EMG) versus voiding cystourethrogram (VCUG) for detrusor-external sphincter dyssynergy (DESD). Neurourol Urodyn 2005;24(7): 616-21. 10. Dykstra DD, Sidi AA, Scott AB, Pagel JM, Goldish GD. Effects of botulinum A toxin on detrusor-sphincter dyssynergia in spinal cord injury patients. J Urol 1988;139(5): 919-22. 11. Schurch B, Stohrer M, Kramer G, Schmid DM, Gaul G, Hauri D. Botulinum-A toxin for treating detrusor hyperreflexia in spinal cord injured patients: a new alternative to anticholinergic drugs? Preliminary results. J Urol 2000;164(3 Pt 1): 692-7. 12. Smith CP, Somogyi GT, Chancellor MB. Botulinum toxin: poisoning the spastic bladder and urethra. Rev Urol 2002;4(2): 61-8. 13. Smith CP, Somogyi GT, Chancellor MB. Emerging role of botulinum toxin in the treatment of neurogenic and non-neurogenic voiding dysfunction. Curr Urol Rep 2002;3(5): 382-7. 14. Dykstra DD, Sidi AA. Treatment of detrusor-sphincter dyssynergia with botulinum A toxin: a double-blind study. Arch Phys Med Rehabil 1990;71(1): 24-6. 15. Schurch B. The role of botulinum toxin in neurourology. Drugs Today (Barc) 2004;40(3): 205-12. 16. Schurch B, Hauri D, Rodic B, Curt A, Meyer M, Rossier AB. Botulinum-A toxin as a treatment of detrusor-sphincter dyssynergia: a prospective study in 24 spinal cord injury patients. J Urol 1996;155(3): 1023-9. 17. de Seze M, Petit H, Gallien P, et al. Botulinum A toxin and detrusor sphincter dyssynergia: a double-blind lidocaine-controlled study in 13 patients with spinal cord disease. Eur Urol 2002;42(1): 56-62. 18. Kuo HC. Botulinum A toxin urethral injection for the treatment of lower urinary tract dysfunction. J Urol 2003;170(5): 1908-12. 19. Smith CP, Nishiguchi J, O'Leary M, Yoshimura N, Chancellor MB. Single-institution experience in 110 patients with botulinum toxin A injection into bladder or urethra. Urology 2005;65(1): 37-41. 20. Dressler D, Eleopra R. Clinical use of non-A botulinum toxins: botulinum toxin type B. Neurotox Res 2006;9(2-3): 121-5. 21. Yoshida M, Masunaga K, Nagata T, Yono M, Homma Y. The forefront for novel therapeutic agents based on the pathophysiology of lower urinary tract dysfunction: pathophysiology and pharmacotherapy of overactive bladder. J Pharmacol Sci 2010;112(2): 128-34. 22. Milsom I, Abrams P, Cardozo L, Roberts RG, Thuroff J, Wein AJ. How widespread are the symptoms of an overactive bladder and how are they managed? A population-based prevalence study. BJU Int 2001;87(9): 760-6. 23. Stewart WF, Van Rooyen JB, Cundiff GW, et al. Prevalence and burden of overactive bladder in the United States. World J Urol 2003;20(6): 327-36. 24. Irwin DE, Milsom I, Hunskaar S, et al. Population-based survey of urinary incontinence, overactive bladder, and other lower urinary tract symptoms in five countries: results of the EPIC study. Eur Urol 2006;50(6): 1306-14; discussion 14-5. 25. Homma Y, Kakizaki H, Gotoh M, et al. [Epidemiologic survey on lower urinary tract symptoms in Japan.] (in Japanese). J Neurogenic Bladder Soc 2003;14: 266-77. 26. Morris AR, Westbrook JI, Moore KH. A longitudinal study over 5 to 10 years of clinical outcomes in women with idiopathic detrusor overactivity. BJOG 2008;115(2): 239-46. 27. Chung MK, Butrick CW, Chung CW. The overlap of interstitial cystitis/painful bladder syndrome and overactive bladder. JSLS 2010;14(1): 83-90. 28. Agency for Health Care Policy and Research (AHCPR). Urinary incontinence in adults: clinical practice guideline updates. Agency for Health Care Policy and Research, Rockville, MD, March 1996. http://www.ahrq.gov/clinic/uiovervw.htm . Accessed August 31, 2010. 29. Chapple CR, Khullar V, Gabriel Z, Muston D, Bitoun CE, Weinstein D. The effects of antimuscarinic treatments in overactive bladder: an update of a systematic review and meta-analysis. Eur Urol 2008;54(3): 543-62. 30. Giannantoni A, Di Stasi SM, Nardicchi V, et al. Botulinum-A toxin injections into the detrusor muscle decrease nerve growth factor bladder tissue levels in patients with neurogenic detrusor overactivity. J Urol 2006;175(6): 2341-4. 31. Schulte-Baukloh H, Schobert J, Stolze T, Sturzebecher B, Weiss C, Knispel HH. Efficacy of botulinum-A toxin bladder injections for the treatment of neurogenic detrusor overactivity in multiple sclerosis patients: an objective and subjective analysis. Neurourol Urodyn 2006;25(2): 110-5. 32. Reitz A, Stohrer M, Kramer G, et al. European experience of 200 cases treated with botulinum-A toxin injections into the detrusor muscle for urinary incontinence due to neurogenic detrusor overactivity. Eur Urol 2004;45(4): 510-5. 33. Grosse J, Kramer G, Stohrer M. Success of repeat detrusor injections of botulinum a toxin in patients with severe neurogenic detrusor overactivity and incontinence. Eur Urol 2005;47(5): 653-9. 34. Kuo HC. Therapeutic effects of suburothelial injection of botulinum a toxin for neurogenic detrusor overactivity due to chronic cerebrovascular accident and spinal cord lesions. Urology 2006;67(2): 232-6. 35. Schurch B, Denys P, Kozma CM, Reese PR, Slaton T, Barron RL. Botulinum toxin A improves the quality of life of patients with neurogenic urinary incontinence. Eur Urol 2007;52(3): 850-8. 36. Herschorn S, Gajewski J, Ethans K, et al. Efficacy of botulinum toxin A injection for neurogenic detrusor overactivity and urinary incontinence – a randomized double-blind trial (abstr 33). Presented at International Continence Society, September, 2009, San Francisco, CA 2009. 37. Ghalayini IF, Al-Ghazo MA, Elnasser ZA. Is efficacy of repeated intradetrusor botulinum toxin type A (Dysport) injections dose dependent? Clinical and urodynamic results after four injections in patients with drug-resistant neurogenic detrusor overactivity. Int Urol Nephrol 2009;41(4): 805-13. 38. Kajbafzadeh AM, Nikfarjam L, Mahboubi AH, Dianat S. Antibody formation following botulinum toxin type A (Dysport) injection in children with intractable bladder hyper-reflexia. Urology 2010;76(1): 233-7. 39. Dykstra D, Enriquez A, Valley M. Treatment of overactive bladder with botulinum toxin type B: a pilot study. Int Urogynecol J Pelvic Floor Dysfunct 2003;14(6): 424-6. 40. Ghei M, Maraj BH, Miller R, et al. Effects of botulinum toxin B on refractory detrusor overactivity: a randomized, double-blind, placebo controlled, crossover trial. J Urol 2005;174(5): 1873-7; discussion 77. 41. Hirst GR, Watkins AJ, Guerrero K, et al. Botulinum toxin B is not an effective treatment of refractory overactive bladder. Urology 2007;69(1): 69-73. 42. Kessler TM, Danuser H, Schumacher M, Studer UE, Burkhard FC. Botulinum A toxin injections into the detrusor: an effective treatment in idiopathic and neurogenic detrusor overactivity? Neurourol Urodyn 2005;24(3): 231-6. 43. Rajkumar GN, Small DR, Mustafa AW, Conn G. A prospective study to evaluate the safety, tolerability, efficacy and durability of response of intravesical injection of botulinum toxin type A into detrusor muscle in patients with refractory idiopathic detrusor overactivity. BJU Int 2005;96(6): 848-52. 44. Popat R, Apostolidis A, Kalsi V, Gonzales G, Fowler CJ, Dasgupta P. A comparison between the response of patients with idiopathic detrusor overactivity and neurogenic detrusor overactivity to the first intradetrusor injection of botulinum-A toxin. J Urol 2005;174(3): 984-9. 45. Schulte-Baukloh H, Weiss C, Stolze T, Sturzebecher B, Knispel HH. Botulinum-A toxin for treatment of overactive bladder without detrusor overactivity: urodynamic outcome and patient satisfaction. Urology 2005;66(1): 82-7. 46. Kuo HC. Urodynamic evidence of effectiveness of botulinum A toxin injection in treatment of detrusor overactivity refractory to anticholinergic agents. Urology 2004;63(5): 868-72. 47. Anger JT, Weinberg A, Suttorp MJ, Litwin MS, Shekelle PG. Outcomes of intravesical botulinum toxin for idiopathic overactive bladder symptoms: a systematic review of the literature. J Urol 2010;183(6): 2258-64. 48. Dmochowski R, Chapple C, Nitti VW, et al. Efficacy and safety of onabotulinumtoxinA for idiopathic overactive bladder: a double-blind, placebo controlled, randomized, dose ranging trial. J Urol 2010;184(6): 2416-22. 49. Flynn MK, Amundsen CL, Perevich M, Liu F, Webster GD. Outcome of a randomized, double-blind, placebo controlled trial of botulinum A toxin for refractory overactive bladder. J Urol 2009;181(6): 2608-15. 50. Werner M, Schmid DM, Schussler B. Efficacy of botulinum-A toxin in the treatment of detrusor overactivity incontinence: a prospective nonrandomized study. Am J Obstet Gynecol 2005;192(5): 1735-40. 51. Schmid DM, Sauermann P, Werner M, et al. Experience with 100 cases treated with botulinum-A toxin injections in the detrusor muscle for idiopathic overactive bladder syndrome refractory to anticholinergics. J Urol 2006;176(1): 177-85. 52. Cohen BL, Barboglio P, Rodriguez D, Gousse AE. Preliminary results of a dose-finding study for botulinum toxin-A in patients with idiopathic overactive bladder: 100 versus 150 units. Neurourol Urodyn 2009;28(3): 205-8. 53. Watanabe JH, Campbell JD, Ravelo A, Chancellor MB, Kowalski J, Sullivan SD. Cost analysis of interventions for antimuscarinic refractory patients with overactive bladder. Urology 2010;76(4): 835-40. 54. Nickel JC. A new approach to understanding and managing chronic prostatitis and interstitial cystitis. Rev Urol 2010;12(1): 67-68. 55. Clemens J, Stoto M, Elliott M, et al. Prevalence of interstitial cystitis/painful bladder syndrome in the United States (abstr 261). Presented at International Continence Society 39th Annual Meeting; September 29-October 3, 2009; San Francisco, CA. 56. Parsons JK, Kurth K, Sant GR. Epidemiologic issues in interstitial cystitis. Urology 2007;69(4 Suppl): 5-8. 57. Evans RJ, Sant GR. Current diagnosis of interstitial cystitis: an evolving paradigm. Urology 2007;69(4 Suppl): 64-72. 58. Moldwin RM, Evans RJ, Stanford EJ, Rosenberg MT. Rational approaches to the treatment of patients with interstitial cystitis. Urology 2007;69(4 Suppl): 73-81. 59. Parsons CL, Zupkas P, Parsons JK. Intravesical potassium sensitivity in patients with interstitial cystitis and urethral syndrome. Urology 2001;57(3): 428-32; discussion 32-3. 60. Hanno PM, Sant GR. Clinical highlights of the National Institute of Diabetes and Digestive and Kidney Diseases/Interstitial Cystitis Association scientific conference on interstitial cystitis. Urology 2001;57(6 Suppl 1): 2-6. 61. Payne CK, Mosbaugh PG, Forrest JB, et al. Intravesical resiniferatoxin for the treatment of interstitial cystitis: a randomized, double-blind, placebo controlled trial. J Urol 2005;173(5): 1590-4. 62. Nickel JC, Barkin J, Forrest J, et al. Randomized, double-blind, dose-ranging study of pentosan polysulfate sodium for interstitial cystitis. Urology 2005;65(4): 654-8. 63. Sant GR, Propert KJ, Hanno PM, et al. A pilot clinical trial of oral pentosan polysulfate and oral hydroxyzine in patients with interstitial cystitis. J Urol 2003;170(3): 810-5. 64. Hanno PM, Buehler J, Wein AJ. Use of amitriptyline in the treatment of interstitial cystitis. J Urol 1989;141(4): 846-8. 65. Sairanen J, Forsell T, Ruutu M. Long-term outcome of patients with interstitial cystitis treated with low dose cyclosporine A. J Urol 2004;171(6 Pt 1): 2138-41. 66. Brady CM, Apostolidis AN, Harper M, et al. Parallel changes in bladder suburothelial vanilloid receptor TRPV1 and pan-neuronal marker PGP9.5 immunoreactivity in patients with neurogenic detrusor overactivity after intravesical resiniferatoxin treatment. BJU Int 2004;93(6): 770-6. 67. Cockayne DA, Hamilton SG, Zhu QM, et al. Urinary bladder hyporeflexia and reduced pain-related behaviour in P2X3-deficient mice. Nature 2000;407(6807): 1011-5. 68. Beltinger J, McKaig BC, Makh S, Stack WA, Hawkey CJ, Mahida YR. Human colonic subepithelial myofibroblasts modulate transepithelial resistance and secretory response. Am J Physiol 1999;277(2 Pt 1): C271-9. 69. Vera PL, Wang X, Meyer-Siegler KL. Neural control of substance P induced up-regulation and release of macrophage migration inhibitory factor in the rat bladder. J Urol 2008;180(1): 373-8. 70. Cayan S, Coskun B, Bozlu M, Acar D, Akbay E, Ulusoy E. Botulinum toxin type A may improve bladder function in a rat chemical cystitis model. Urol Res 2003;30(6): 399-404. 71. Steers WD, Tuttle JB. Mechanisms of Disease: the role of nerve growth factor in the pathophysiology of bladder disorders. Nat Clin Pract Urol 2006;3(2): 101-10. 72. Smith CP, Radziszewski P, Borkowski A, Somogyi GT, Boone TB, Chancellor MB. Botulinum toxin a has antinociceptive effects in treating interstitial cystitis. Urology 2004;64(5): 871-5; discussion 75. 73. Kuo HC. Preliminary results of suburothelial injection of botulinum a toxin in the treatment of chronic interstitial cystitis. Urol Int 2005;75(2): 170-4. 74. Giannantoni A, Costantini E, Di Stasi SM, Tascini MC, Bini V, Porena M. Botulinum A toxin intravesical injections in the treatment of painful bladder syndrome: a pilot study. Eur Urol 2006;49(4): 704-9. 75. Giannantoni A, Porena M, Costantini E, Zucchi A, Mearini L, Mearini E. Botulinum A toxin intravesical injection in patients with painful bladder syndrome: 1-year followup. J Urol 2008;179(3): 1031-4. 76. Kuo HC, Chancellor MB. Comparison of intravesical botulinum toxin type A injections plus hydrodistention with hydrodistention alone for the treatment of refractory interstitial cystitis/painful bladder syndrome. BJU Int 2009;104(5): 657-61. 77. Tsai SJ, Ying TH, Huang YH, Cheng JW, Bih LI, Lew HL. Transperineal injection of botulinum toxin A for treatment of detrusor sphincter dyssynergia: localization with combined fluoroscopic and electromyographic guidance. Arch Phys Med Rehabil 2009;90(5): 832-6. 78. Apostolidis A, Popat R, Yiangou Y, et al. Decreased sensory receptors P2X3 and TRPV1 in suburothelial nerve fibers following intradetrusor injections of botulinum toxin for human detrusor overactivity. J Urol 2005;174(3): 977-82; discussion 82-3. 79. Stern JA, Hsieh YC, Schaeffer AJ. Residual urine in an elderly female population: novel implications for oral estrogen replacement and impact on recurrent urinary tract infection. J Urol 2004;171(2 Pt 1): 768-70. 80. Kuo HC. Comparison of effectiveness of detrusor, suburothelial and bladder base injections of botulinum toxin a for idiopathic detrusor overactivity. J Urol 2007;178(4 Pt 1): 1359-63. 81. Mehnert U, Boy S, Schmid M, et al. A morphological evaluation of botulinum neurotoxin A injections into the detrusor muscle using magnetic resonance imaging. World J Urol 2009;27(3): 397-403. 82. Zermann D, Ishigooka M, Schubert J, Schmidt R. Trigonum and bladder base injection of botulinumtoxin A (BTX) in patients with severe urgency-frequency-syndrome refractory to conservative medical treatment and electrical stimulation. Neurourol Urodynam 2001;20: 412-13. 83. Karsenty G, Elzayat E, Delapparent T, St-Denis B, Lemieux MC, Corcos J. Botulinum toxin type a injections into the trigone to treat idiopathic overactive bladder do not induce vesicoureteral reflux. J Urol 2007;177(3): 1011-4. 84. Mascarenhas F, Cocuzza M, Gomes CM, Leao N. Trigonal injection of botulinum toxin-A does not cause vesicoureteral reflux in neurogenic patients. Neurourol Urodyn 2008;27(4): 311-4. 85. Kalsi V, Apostolidis A, Gonzales G, Elneil S, Dasgupta P, Fowler CJ. Early effect on the overactive bladder symptoms following botulinum neurotoxin type A injections for detrusor overactivity. Eur Urol 2008;54(1): 181-7. 86. Kuo HC. Clinical effects of suburothelial injection of botulinum A toxin on patients with nonneurogenic detrusor overactivity refractory to anticholinergics. Urology 2005;66(1): 94-8. 87. O’Leary M, Dierich M. Urinary tract dysfunction in neurological disorders: the nurses’ role in assessment and management. J Neuroscience Nursing 2010;42: E8-E23. 88. Sahai A, Dowson C, Khan MS, Dasgupta P. Repeated injections of botulinum toxin-A for idiopathic detrusor overactivity. Urology 2010;75(3): 552-8. 89. Brubaker L, Richter HE, Visco A, et al. Refractory idiopathic urge urinary incontinence and botulinum A injection. J Urol 2008;180(1): 217-22. 90. 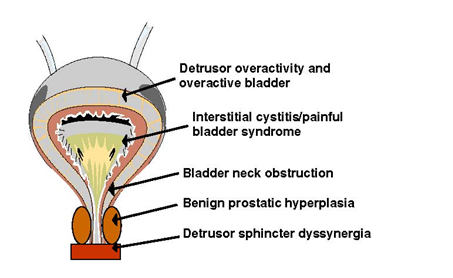 Sahai A, Sangster P, Kalsi V, Khan MS, Fowler CJ, Dasgupta P. Assessment of urodynamic and detrusor contractility variables in patients with overactive bladder syndrome treated with botulinum toxin-A: is incomplete bladder emptying predictable? BJU Int 2009;103(5): 630-4. 91. White WM, Pickens RB, Doggweiler R, Klein FA. Short-term efficacy of botulinum toxin a for refractory overactive bladder in the elderly population. J Urol 2008;180(6): 2522-6. 92. Kessler TM, Khan S, Panicker J, Roosen A, Elneil S, Fowler CJ. Clean intermittent self-catheterization after botulinum neurotoxin type A injections: short-term effect on quality of life. Obstet Gynecol 2009;113(5): 1046-51. 93. Krieger JN, Nyberg L, Jr., Nickel JC. NIH consensus definition and classification of prostatitis. JAMA 1999;282(3): 236-7. 94. Nickel JC. The overlapping lower urinary tract symptoms of benign prostatic hyperplasia and prostatitis. Curr Opin Urol 2006;16(1): 5-10. 95. Tanguay S, Awde M, Brock G, et al. Diagnosis and management of benign prostatic hyperplasia in primary care. Can Urol Assoc J 2009;3(3 Suppl 2): S92-S100. 96. St Sauver JL, Jacobson DJ, McGree ME, Girman CJ, Lieber MM, Jacobsen SJ. Longitudinal association between prostatitis and development of benign prostatic hyperplasia. Urology 2008;71(3): 475-9; discussion 79. 97. Tang J, Yang J. Etiopathogenesis of benign prostatic hypeprlasia. Indian J Urol 2009;25(3): 312-7. 98. Krieger JN, Lee SW, Jeon J, Cheah PY, Liong ML, Riley DE. Epidemiology of prostatitis. Int J Antimicrob Agents 2008;31 Suppl 1: S85-90. 99. Collins MM, Stafford RS, O'Leary MP, Barry MJ. How common is prostatitis? A national survey of physician visits. J Urol 1998;159(4): 1224-8. 100. Roberts RO, Lieber MM, Rhodes T, Girman CJ, Bostwick DG, Jacobsen SJ. Prevalence of a physician-assigned diagnosis of prostatitis: the Olmsted County Study of Urinary Symptoms and Health Status Among Men. Urology 1998;51(4): 578-84. 101. Wagenlehner FM, Naber KG, Bschleipfer T, Brahler E, Weidner W. Prostatitis and male pelvic pain syndrome: diagnosis and treatment. Dtsch Arztebl Int 2009;106(11): 175-83. 102. Laborde EE, McVary KT. Medical management of lower urinary tract symptoms. Rev Urol 2009;11(Suppl 1): S19-25. 103. Doggweiler R, Zermann DH, Ishigooka M, Schmidt RA. Botox-induced prostatic involution. Prostate 1998;37(1): 44-50. 104. Pennefather JN, Lau WA, Mitchelson F, Ventura S. The autonomic and sensory innervation of the smooth muscle of the prostate gland: a review of pharmacological and histological studies. J Auton Pharmacol 2000;20(4): 193-206. 105. Chuang Y, Chancellor M. The application of botulinum toxin in the prostate. J Urol 2006;176: 2376-86. 106. Chuang YC, Huang CC, Kang HY, et al. Novel action of botulinum toxin on the stromal and epithelial components of the prostate gland. J Urol 2006;175(3 Pt 1): 1158-63. 107. Chuang YC, Tu CH, Huang CC, et al. Intraprostatic injection of botulinum toxin type-A relieves bladder outlet obstruction in human and induces prostate apoptosis in dogs. BMC Urol 2006;6: 12. 108. Lin AT, Yang AH, Chen KK. 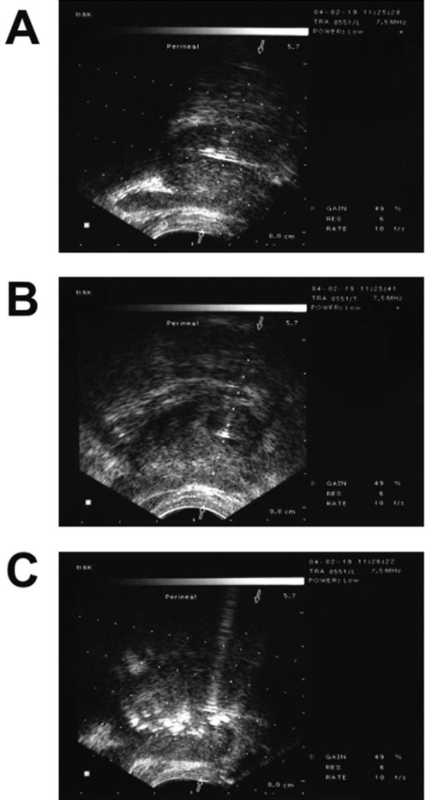 Effects of botulinum toxin A on the contractile function of dog prostate. Eur Urol 2007;52(2): 582-9. 109. Kuo HC. Prostate botulinum A toxin injection--an alternative treatment for benign prostatic obstruction in poor surgical candidates. Urology 2005;65(4): 670-4. 110. Silva J, Pinto R, Carvalho T, et al. Intraprostatic Botulinum Toxin Type A injection in patients with benign prostatic enlargement: duration of the effect of a single treatment. BMC Urol 2009;9: 9. 111. Nikoobakht M, Daneshpajooh A, Ahmadi H, et al. Intraprostatic botulinum toxin type A injection for the treatment of benign prostatic hyperplasia: Initial experience with Dysport. Scand J Urol Nephrol 2010;44(3): 151-7. 112. Chuang Y, Chiang P, Huang C, Yoshimura N, Chancellor M. Botulinum toxin type A improves benign prostatic hyperplasia symptoms in patients with small prostates. Urology 2005;66: 775-79. 113. Chuang YC, Yoshimura N, Huang CC, Wu M, Chiang PH, Chancellor MB. Intraprostatic botulinum toxin a injection inhibits cyclooxygenase-2 expression and suppresses prostatic pain on capsaicin induced prostatitis model in rat. J Urol 2008;180(2): 742-8. 114. Chuang YC, Tyagi P, Huang CC, et al. Urodynamic and immunohistochemical evaluation of intravesical botulinum toxin A delivery using liposomes. J Urol 2009;182(2): 786-92. 115. Petrou SP, Parker AS, Crook JE, Rogers A, Metz-Kudashick D, Thiel DD. Botulinum a toxin/dimethyl sulfoxide bladder instillations for women with refractory idiopathic detrusor overactivity: a phase 1/2 study. Mayo Clin Proc 2009;84(8): 702-6. 116. Neel KF, Salem M, Soliman S. Total endoscopic management (TEM approach) of children with non-compliant neuropathic bladder: a preliminary report. J Pediatr Urol 2008;4(2): 124-6.